South Indian cuisine has this peculiar quality – it makes you crave. 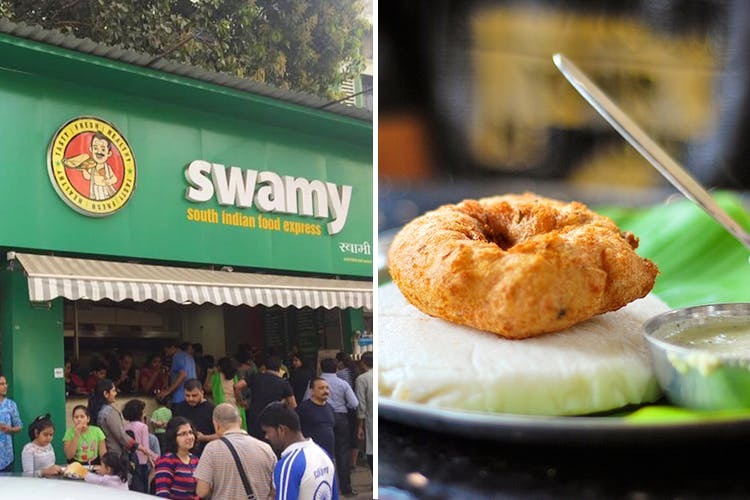 And the next time folks in Thane are having a dosa idli craving, they should just head to Swamy – South Indian Food Express, for a yummy meal with quick service that will barely harm your pocket. A small eatery, Swamy believes in sticking to its core without wasting much time on ambience, décor, music, and interiors. With no compromise on hygiene and a prompt service, Swamy is a popular dosa place with the Thane residents who often flock here for Sunday breakfasts. They have no seating, only table you can stand around to quickly hog and leave. Alternatively, you can choose to get a takeaway to eat in the comfort of your house. There is absolutely nothing quirky about their menu. But the way they have stuck to the regular south Indian menu is praiseworthy. Nothing elaborate, they have a one-page menu which is just as crisp as their dosas. Two types of idlis, three types of vadas, four variants of dosas and your regular uttapams is all they have, with nothing costing more than INR 45. This is followed by quick lunch combos and the strongly recommended options are bisibilli rice (INR 40), and rasam rice (INR 40). To wash it all down, their filter coffee (INR 20) is what drives people crazy. And on the colder side, their ginger lemon drink (INR 20) and buttermilk (INR 15) are equally good. End your meal on a sweet note with the only dessert option they have – sheera (INR 40) – which will be an ultimate end to your super quick meal. Be it any time of the month, don’t hold that craving back. Swamy in Thane is an ideal choice to get your dose of south Indian flavours even when you’re short in cash or time.